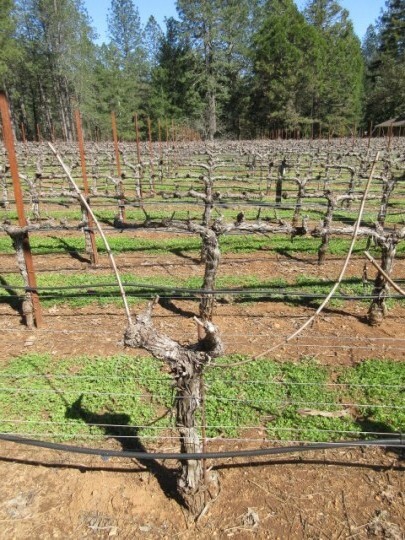 Winter persists on Howell Mountain. Normally, the seasonal rain ends in March and resumes in November. It has rained every week in April and the high temperatures have occasionally and briefly reached the 60s. We need about 6 months of heat and sunshine for the vines to transform buds into ripe fruit. For each day of winter in April, we need a day of summer in October. It’s good to be optimistic farmers. 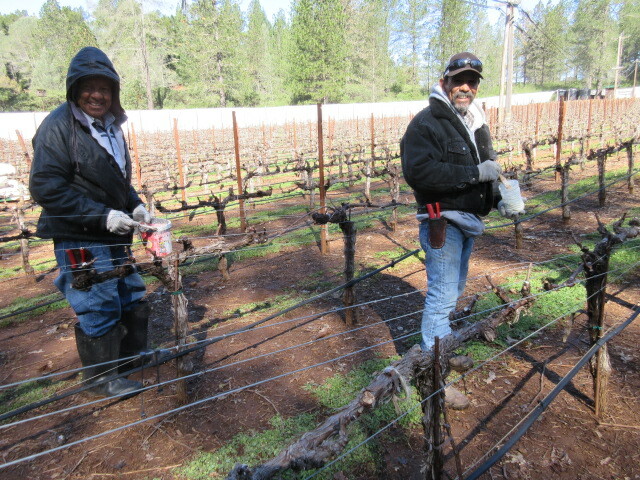 Our work began in March when we prepared the vineyard for pruning. 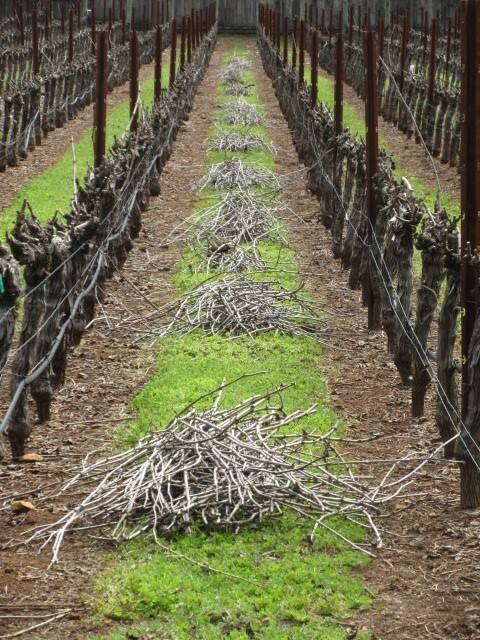 The above photo shows the vineyard dense with dormant and leafless canes which must be pruned and removed from the vineyard. Each cane is standing between (and normally attached by tendrils to) 4 training wires. 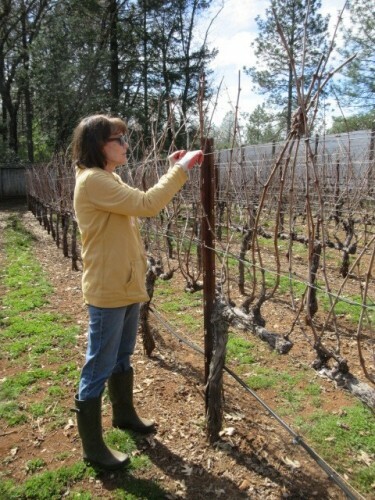 To make the pruning efficient for our vineyard workers, we detach the training wires from each stake and from the canes, as you see Barb doing. We temporarily reattach the wires below the cordons (the arms of the vine). 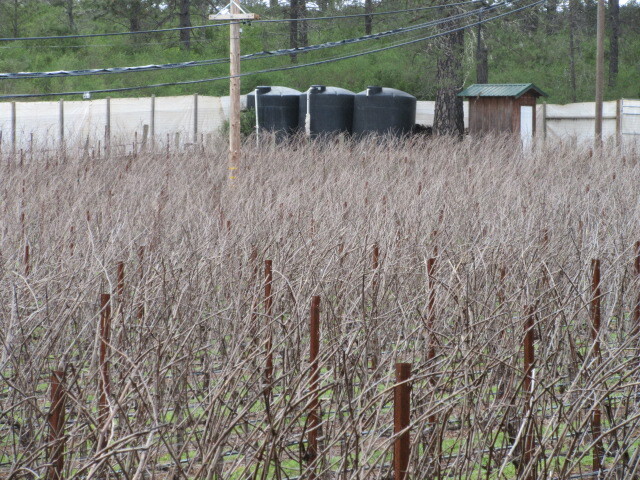 Without wires in the way, the vineyard workers quickly cut the canes and drop them between rows. We developed a cross-fit workout routine to remove the canes using our pick up truck and modified electric wheelbarrow. It consists of bending to lift a large and unruly pile of sticks off the ground, hoisting it high above our shoulders, and slamming it onto the truck or wheelbarrow in rapid and prolonged reps. If your gym introduces this maneuver, you can say you saw it here first. Anybody can do that with a medicine ball. 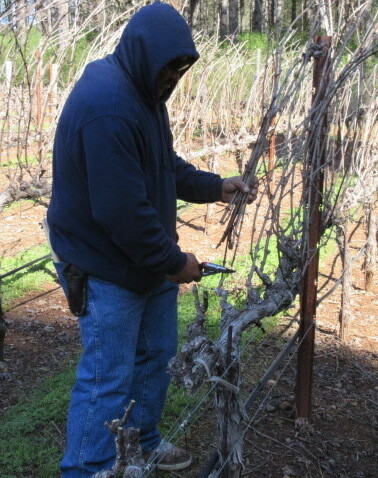 Immediately after pruning, each pruning cut has to be swabbed with a protective sealant to minimize the risk of euytypa, a grapevine disease that results from rain driving infected spores into the unsealed wounds. This sounds like an unskilled task Gerry could do right? He tried 2 years ago and applied more sealant to his shoes than to the vines, and it took him forever. Barb persuaded him that painting is a skilled task best left to the pros, but complimented him on his colorful and waterproof gym shoes. We have some eutypa throughout our vineyard. That’s normal. The remedy is to cut off the cordon and form a new cordon with a cane that grows below the infection site. The accompanying photo shows a mature and healthy trunk. The infected cordons were cut off on each side and 2 canes were left uncut to be trained as new cordons. The vineyard is pruned, the canes were hauled to the burn pile, the wounds are sealed, and buds have appeared on the vines. Our 8 month adventure is underway. 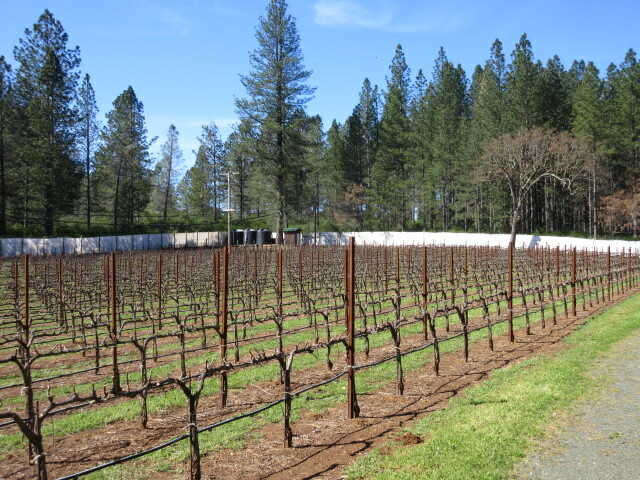 The wall of white bordering the vineyard consists of tarps forming a frost barrier. More on that in the next newsletter. 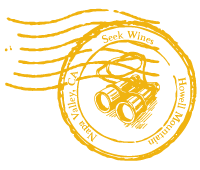 We hope to release our 3 new Howell Mountain wines in late fall. In the meantime, the only wine we have available for purchase on our website is our 2014 Napa Valley Zinfandel. It’s our last production from this amazing and tiny 35 year old vineyard. The 2014 Zinfandel is developing very well in the bottle. If you need some to get through the summer grilling season, now is a good time to order. Ground shipping opportunities are limited after Memorial Day.